You need some safe car pranks to get at your target. Here are 25 prank ideas to help you get started! 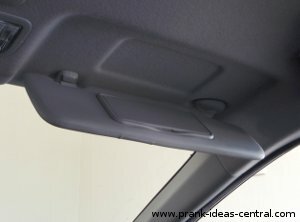 In this car prank idea, you'll be stuffing items into the car visor. Confetti works great in this prank because it does the job of surprising your victim, but it doesn't linger in the air to obstruct vision or hurt the eyes. When your victim pulls down the visor, the confetti will come raining down on them. You'll need a balloon for this prank. Blow it up large enough to be loud when it pops. 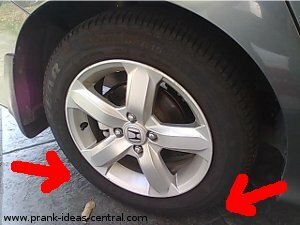 Then tape it to the rear tire that is opposite of the passenger side of the car. You can tape it at either side as shown by the red arrows, depending on which direction you're expecting your victim to drive. When your victim moves his or her car, the balloon will be squashed and will pop, leaving your poor victim wondering what just happened. In this safe car prank you're going to simulate a broken window to freak out your victim. 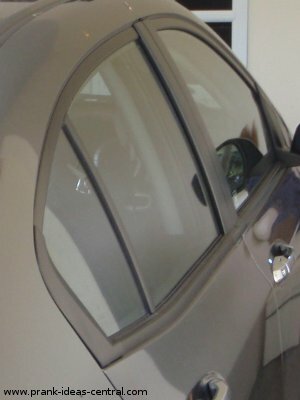 You'll need a car window which you can probably get from a car parts dealer or from a junkyard. Once you get it, smash it up and put it in a bucket or a box so that you can transport it to the scene of the prank. Wind down your victim's car window all the way. From your glass bits, scatter some into the car seat, and some around the car door of the "smashed" window. You can either let your victim discover the crime scene on his or her own in due time, or you can speed up the process by running to them and excitedly tell them that something happened to their car window. You'll need lots of Post-It Notes to stick over the entire surface of your victim's car. If you want, you can write notes for your victim, or really random things on the sticky notes. This safe car prank is better played with a group as it will be a lot faster sticking the post it notes on the car. However, you can easily do this alone, provided you have enough time with the car before your victim gets near to it. Buy ping-ping balls. Lots of it. Now wind down a car window from the passenger side and start pouring in the ping-pong balls by the bucketfuls. As the ping-pong ball level rises, wind up the car window as high up as you can and continue filling the car until you start to overflow. Imagine the look on the face of your victim when he or she sees ping-pong balls through the un-tinted window of the car. 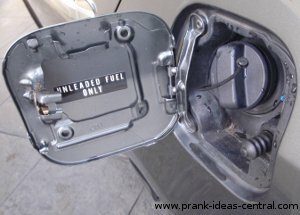 Although the title of this safe car prank suggests that you fill the entire cabin of the car, there is an optional way to play this prank that doesn't require you to fill it up. It is sufficient to fill it up up to the seat level if you want the balls to roll out when your victim opens the car door. Playing it this way will add an element of surprise as your victim might not notice the balls until it is too late. I'm sure that you know of the sugar in the gas tank prank by now. Personally, I'd classify it as sabotage rather than a prank because putting sugar in the fuel tank of a car can cause some serious damage. In this safe car prank, we're NOT going to put sugar into the tank, but we'll make the victim think that there's sugar in the tank. To prepare for this prank, make sure you 'educate' your victim on the dangers of the sugar in the tank prank, if they don't already know about the prank. Proceed to place a noticeable amount of sugar around the entrance of the car gas tank (keep the tank capped, of course). Leave a note that suggests that someone is getting back at your friend (e.g. "That's for cutting me off in traffic!"). In this safe car prank, you will need to know a little of your victim's schedule. When your victim is away from his or her car, park it a row or 2 away from the original location. 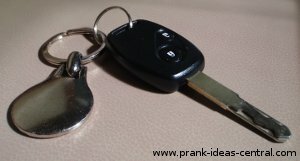 If you can, make a duplicate key of your victim's car so that you can randomly relocate the car in the weeks to come. Guaranteed to bewilder your victim. 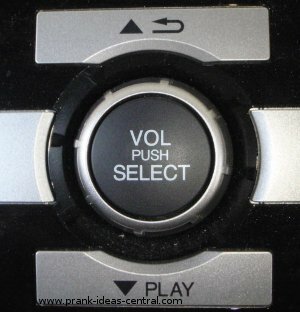 In this safe car prank, you will be turning up the volume of the car radio to the maximum. For most cars I've encountered, the digital radio/mp3/CD players keep the state of the radio. That means that if you don't turn off the radio before killing your engine, the next time you start your car it will come on automatically. On top of that, the volume and station will be at your last set one. So start the car before you crank up the volume. Be sure to change the channel to a station that your victim doesn't like, or pop in a CD or tape with a song that he or she loathes, then turn off the engine. You can be sure your victim will get a rather unpleasant surprise the next time the car starts. If it has an old style analog dial, just crank it up to the maximum and make sure the on button is pressed so that the radio will blast when the car is started.